Many Canadian children suffer from early childhood caries (ECC) – which means they have one or more decayed, missing, or filled primary teeth. In Canada, the prevalence of ECC varies greatly. It may be as low as 6-8% among infants and toddlers from urban centres, but can be as high as 90% or greater in remote First Nations and Inuit communities. Early childhood caries is one of the most common childhood diseases and rehabilitative dental surgery for severe forms of ECC is the most common day surgery procedure among Canadian preschool children, compared with ear tube insertions and tonsillectomy/adenoidectomy. 1Schroth RJ, Harrison RL, Moffatt ME. Providing timely dental treatment for young children under general anesthesia is a government priority. Journal of the Canadian Dental Association 2007;73(3):241-3. 2Canadian Dental Association. 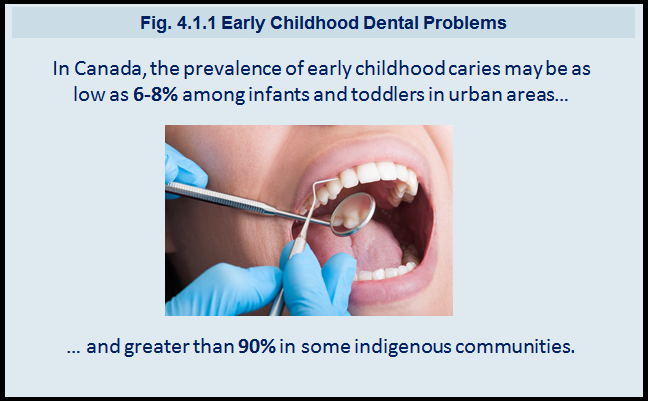 Report of early childhood caries. 2010. 3Canadian Institute for Health Information. Treatment of preventable dental cavities in preschoolers: A focus on day surgery under general anesthesia. 2013.